We finally reached the tip of Vancouver Island on Sunday evening, June 25. It would be our first night of fishing. The red line indicates the route taken by the Reuben Lasker as we transited along the coast to the northernmost tip of the island. The blue lines indicate the path to be taken for regular interval acoustic monitoring for schools of fish. Based on the acoustics results, a decision would be made as to where the fishing would occur at night. The photo at left shows the crew completing the deployment of the fishing net. You can see the large winch that will release and retrieve the main body of the net. The net will be set out for about 45 minutes. During this time there are many variables that will be monitored. Sensors attached to the net will collect data on time spent at each depth. 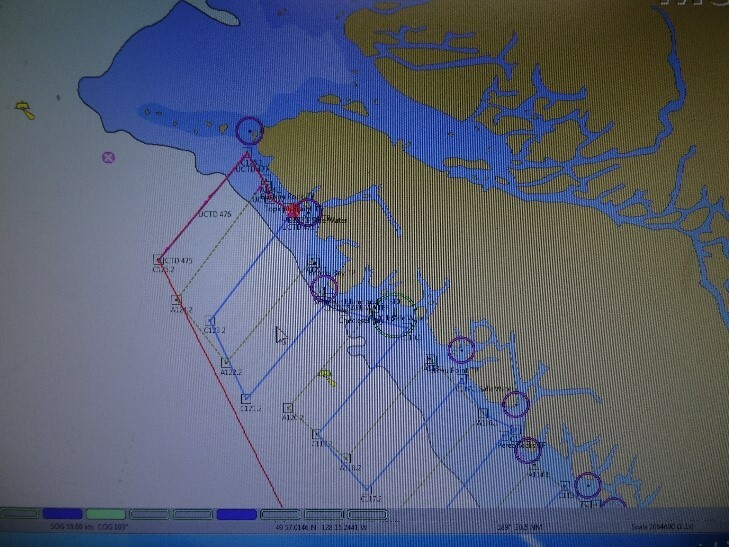 Other factors being monitored include temperature, wind speed, swell size, and lat/long of trawl. In addition, there are four water-activated “pingers” attached to the net that emit sounds at frequencies known to disturb larger mammals in an effort to reduce accidental captures. Once the net has been retrieved, the scientists collect the catch in large baskets and begin the process of weighing and sorting. The first night’s catch was primarily made up of a very unique colonial type of organism called a pyrosome. The side nets and codend (mesh covered end of the main net where most of the catch is collected) were packed with these the first couple of trawls. Many pyrosomes were mixed in with the catch. You can see many pyrosomes mixed in with the rest of the catch here. They are the pink colored cylindrical organisms. They have been increasing in population over the past couple of years as well as appearing further north than ever observed before. A nice overview of the pyrosome influx and volumes observed was recently reported in an article published by Environment entitled “Jellied sea creatures confound scientists, fishermen on U.S. Pacific Coast”. You can review the article here. The trawl net being used was part of the research project, as it possessed modifications aimed at capturing and quantifying organisms that made it through an apparatus called the extruder door. The purpose for this opening is to allow for larger mammals and non-target organisms to pass through the net relatively unharmed should they get caught. Two additional pocket nets had been added to the main net for the specific purpose of monitoring what made it through the mesh. 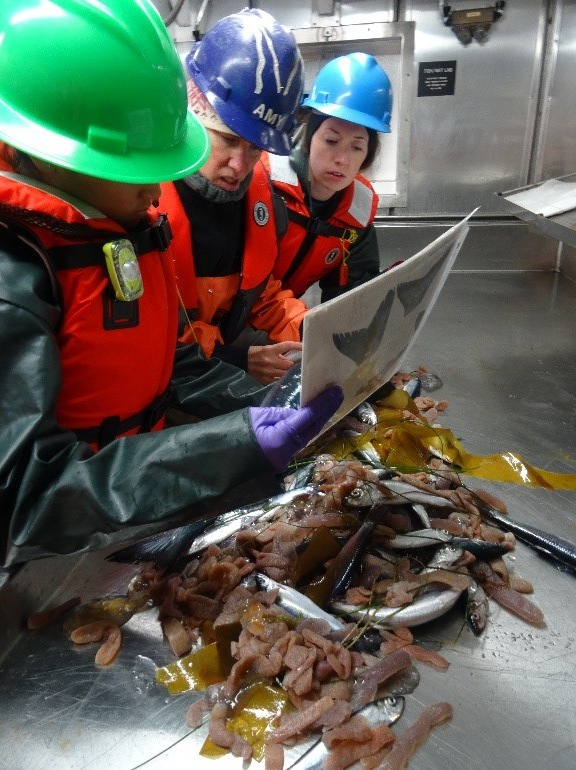 This far north, the researchers were expecting to find mostly juvenile herring and salmon. On our second night of fishing we actually had several species of fish and other marine animalia to i.d. The amount and type of data collected depended on the species of organism. In some cases, we collected just the mass of the group of organisms as a whole. For other species, we collected mass, lengths, presence/absence of an adipose fin, DNA samples from a fin clip, and more. Certain species were tagged, bagged, and frozen for further study in a land-based lab. It’s so interesting to see the variety we pull out of the net each trawl! What traits could you use to differentiate between the juvenile salmon and Pacific herring? 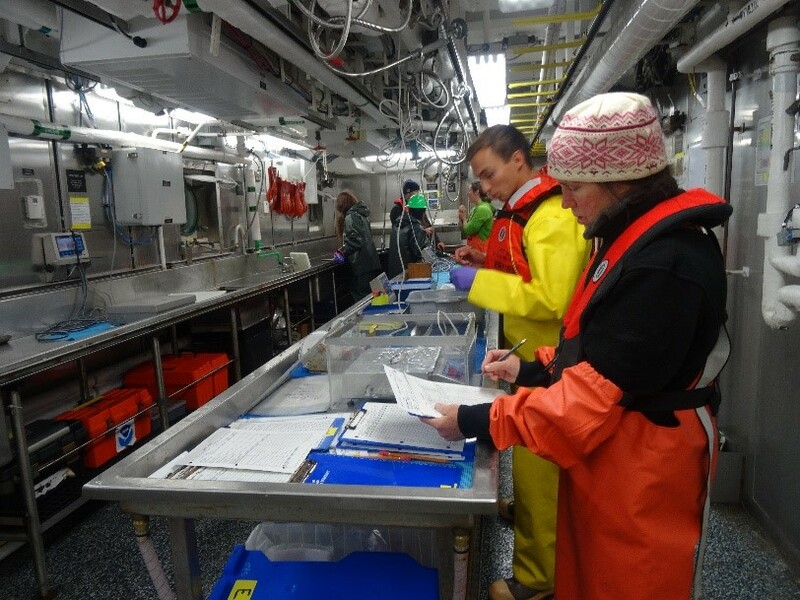 Here are some of the scientists making sure the correct data is collected and recorded from one of our catches. 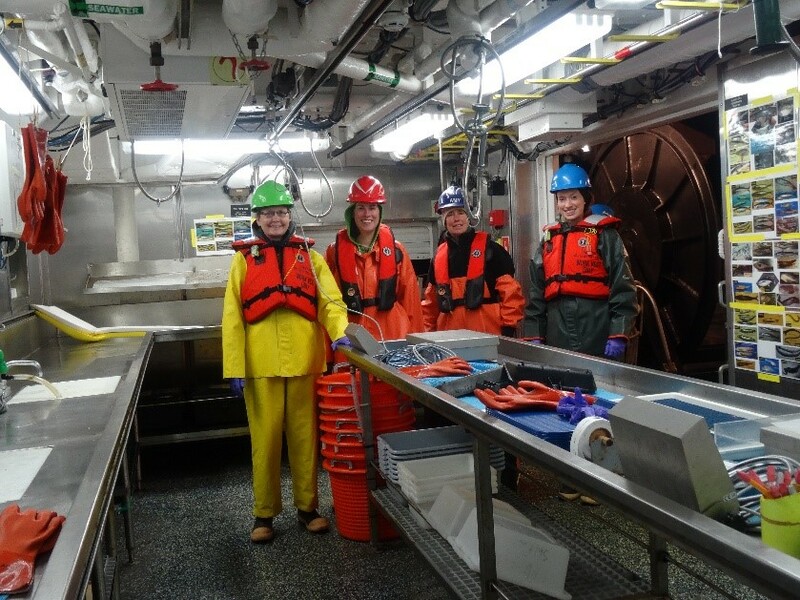 Here I am (in yellow) with some of the scientists (L to R: Emily, Amy, and Angela) getting ready to receive the evening’s catch. 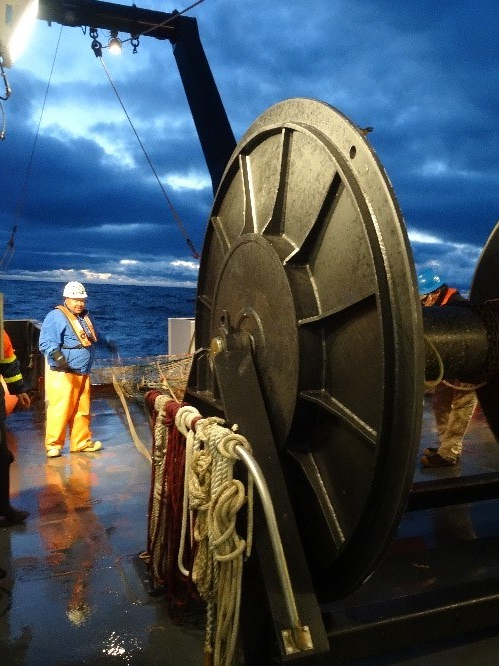 First trawl starts as close to sunset as possible, which for this latitude has been somewhere between 9:30-10:00 p.m. There is always this air of anticipation as we wait for the net to be emptied. It has been enlightening to work with the science staff as they evaluate each sample. The number of reference sheets and data recording forms is incredible. It seems like you would need to take a course in data management just to ensure you were familiar enough with the requirements to not overlook some detail of importance. The photo of the group above was taken about 11:00 p.m. I was worried initially that I would not be able to flip my sleep schedule to match the work schedule, but it has been much more doable than I thought it would be. Our staterooms are dark and quiet, so going to bed in the morning really doesn’t feel any different that at night. Thanks to the extensive movie collection and my ability to keep downloading books to read on Kindle, I have had plenty of filler for downtime and that “reading before bed” I always do. Time to go to work….. There are 36 species of dolphin worldwide, including 4 species of river dolphins. Quite a few of the Common Bottlenose Dolphin followed the ship out of the harbor in San Diego, riding along on the wake produced by the ship. On the way up the coast of California I saw a couple of Dall’s Porpoises (not in the dolphin family, but quite similar in appearance). Then as we traveled south along Victoria Island there were a couple of Pacific White-Sided dolphins enjoying games along-side the ship. It is so exciting to see these animals out in their native habitat! Every night before the ship drops the fishing net, a member of the science team is sent to the bridge to perform a 30-minute mammal watch. The surrounding waters are observed closely for any signs of these and other larger species. The investigators do their best to ensure that only the small fish species intended for capture are what enters the net. Should there be a sighting, the ship moves on another 5 miles in an effort to avoid any accidental captures. The scientists and crew work very hard to minimize the impact of their studies on the surrounding ecosystems.